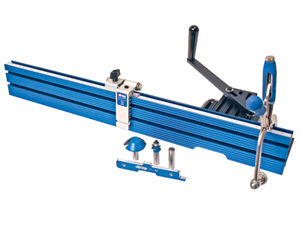 Our Fence kit works on any table top with a center mount router plate system. the fence is made of solid MDF that has Mini-T-Track built in for mounting featherboard's and stop blocks on the front of the fence, as well as a back side Mini-T-Track for mounting to the aluminum "L" Fence (Included). Fence will comfortably accommodate bits up to 3-1/2" in diameter. The fence come with all the necessary parts for quick and simply assembly. The system is also equipped with the handy dust port that envelopes the opening between the 2 MDF fence sections. The removable dust port system allows you to attach a 2-1/2" Shop-Vac® hose directly to the back of the fence. This fence system can be clamped to your table with C-Clamps (not included) or attached with 1/4" x 20 knob and bolt (included)to Mini-T-Track. Our Supreme Fence Kit works on any table top with a center mount router plate system and offers great versatility. 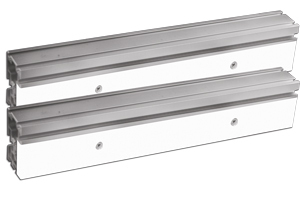 The aluminum extrusion with a UHMW inserts adds excellent stability when running your stock through the cutter. The slick surface of the UHMW inserts allow for easy feed across the fence plate. the inserts are replaceable and also allow them to be used as zero clearance profile cuts. The fence also features a split design allowing for of setting of the fence (with shims). Fence will comfortably accommodate bits up to 3-1/2" in diameter. Three mini-T-tracks in the extrusions (that except 1/4" x 20hex head bolts) allow you to attach stop blocks, featherboard's, and many other jigs and fixtures to this system. This fence system can be clamped to your table with C-Clamps (not included) or attached with 1/4" x 20 knob and bolt (included)to Mini-T-Track. The Deluxe Fence Kit has two MDF fence plates supported by a solid aluminum "L" fence with built in track that will comfortably accommodate router bits up to 3-1/2" in diameter and comes with all the necessary parts for quick and simple assembly. The system is also equipped with a a dust port that envelopes the opening between the two MDF fence sections. The fence has a unique shim system; each side of the fence can be shimmed with an aluminum bar (included) that is inserted into offset tracks of varying depths, which in turn nudges your fence forward to the desired depth. Tall adjustment knobs for moving your fence forward or backward. This innovative, anodized-aluminum fence features a table saw-style T-square adjustment system that ensures the fence will always stay parallel to the miter-gauge slot. The fence adjusts easily with just one hand, and locks firmly in place with dual locks: A large paddle lock on the infeed end, and a quarter-turn lock on the outfeed end that prevents fence deflection. 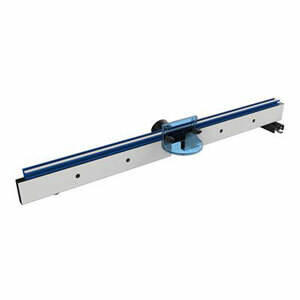 A magnified measuring system with an adjustable measuring scale allows accurate setup with any bit. The included Micro-Adjuster allows you to dial in precision measurements exactly. Independent sliding fence faces can be positioned exactly where needed to provide workpiece support close to the bit, and to maximize chip collection into the fence’s built-in dust port. Two jointing rods come included in this system. Just slide them into position behind the outfeed fence face, and the fence doubles as a jointer for putting perfect edges on boards. Get real precision on any router table. A single-side, universal-mounting design allows the fence to be securely attached to most router table tops from 3/4" to 11/2" (19-38mm) thick. Note: Router bit hole must be located 16" (406mm) from right side of table. Fits 1"-thick (25mm) tables without modification. Thinner or thicker tables may require modification. Beaded Face-Frames are a great way add detail, richness, and value to your fine cabinetry work. The Precision Beaded Face-Frame System works in conjunction with your router table to serve as the fastest, easiest, and most affordable way to build beaded face-frames in a home shop. Through a process of precise notching of rails and stiles, the Precision Beaded Face-Frame System simplifies standard beaded face-frame construction by eliminating the need to make intricate cuts on a table saw, fit and refit miters, or spend thousands of dollars on a large specialized machine. The end result is higher quality, more consistent results, in far less time and with far less effort than before. Note: Precision Beaded Face-Frame System Only, Precision Router Table Top Not Included. Searching for more uniqie look? Kreg has got all the profiles you need to get the job done right. These special bits are designed for use with the Precision Beaded Face-Frame System. 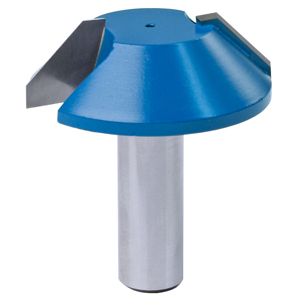 Each bit features high quality 1/2" shank construction along with high-grade carbide tips for extreme durability. 24" fence does NOT have center milled. 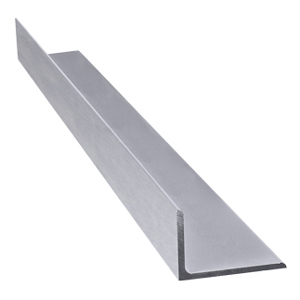 The Aluminum "L" fence is a solid piece of extruded aluminum. The fence can be used for many different fence systems, like router tables, drill press tables and even bandsaw tables. You can use it as a stand alone fence or use it by mounting your independent fence sections to create one "solid" fence, Can be clamped on any table surface or fence can mount onto T-Track with knob and bolts (not included). These MDF Fence Sections are 1" thick x 4" high x 15 1/2" long and come in a pair to be use with our Aluminum L Fence or any shop made sub fence. The Mini T-Track mounted front and back allow for the use of many add on masonries such as stop blocks and feather boards. 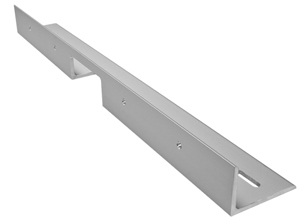 The 16” Uni-T-fence sections come in a pair that can be used with our “L “Fence or any shop made sub fence. True versatility with the Mini T-Track mounted on the top (2 tracks) and front (1 track) of the fence, which allows for the use of many add on items, such as: featherboard's, stop blocks and more. The UHMW insert fences are replaceable, & sacrificial, so you can make zero clearance cut outs for any router bit.